Saudi Arabia launches airstrikes against rebels in Yemen. 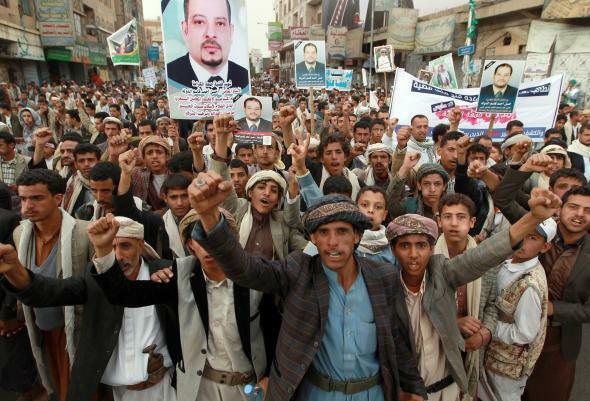 Houthi supporters march during a demonstration on March 18, 2015 in the Yemeni capital Sanaa. Saudi Arabia launched airstrikes in Yemen on Wednesday as part of a military offensive against Houthi rebels in the country, inserting itself into a conflict in the country that risks devolving into a full-blown proxy war. The rebels, backed by Iran, have made significant enough advances to first drive U.S.-backed President Abed Rabbo Mansour Hadi from the capital city of Sanaa weeks ago and then forced him to flee the country altogether on Wednesday. The Saudi ambassador to the U.S. announced the operation from Washington, D.C., which includes logistical and intelligence support from the U.S., but not direct military involvement. The ambassador said the military advance is a joint operation by a military coalition of nine other countries, but did not name them.